Last September Senator Bernie Sanders introduced legislation — The Prescription Drug Affordability Act of 2015 — to stop soaring increases in pharmaceutical prices. He and Hillary Clinton are both running for the Democratic nomination to be President in 2016; and both offer up their own plan for controlling the high cost of rising prescription drug prices on their websites. However, Hillary has received more campaign cash from drug companies than any other candidate — in either party — even as she proudly declares the industry is one of her biggest enemies. In stark contrast Bernie, received zero contributions from drug companies, and received most of his campaign financing from individual donors and labor unions. So which candidate will launch the most genuine war on Big Pharma? According to government data released this week, significantly higher drug prices contributed to higher Medicare spending in 2014. At least five drugs covered under Medicare Part D had increases of 100% or more. A report based on a new online database released by the Center for Medicare Services (CMS) this week showed that one of the most egregious examples is the pain reliever Vimovo. Its price increased more than 500 percent after it was sold by AstraZeneca to another company (Pfizer attempted to by out AstraZeneca last year). The 2014 drug-price information was part of a new online database called the Medicare Drug Spending Dashboard, which details 80 drugs that ranked the highest by total Medicare spending. CMS said the drugs account for 33% of all Medicare Part D spending, and 71% of all spending on prescriptions by Medicare Part B, which covers drugs administered in doctor’s offices and outpatient clinics. Robert Roach, President of the Alliance for Retired Americans, said "More than 35 million people didn’t fill a prescription last year because they could not afford to." The Alliance is closely tracking what the candidates for President and Congress are pledging to do about prescription drug prices — and are pressing policymakers for change. As evidenced by Pfizer’s proposed $100 billion-plus [hostile] takeover of AstraZeneca, Big Pharma is in the throes of the greatest period of consolidation in a decade. 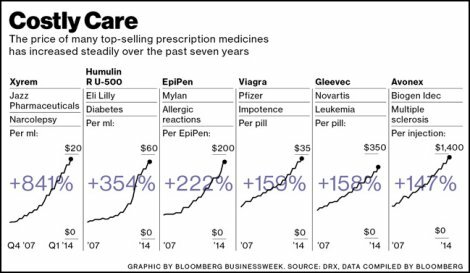 One reality remains unchanged, however: Drug prices keep defying the law of gravity. Since October 2007 the cost of brand-name medicines has soared, with prices doubling for dozens of established drugs that target everything from multiple sclerosis to cancer, blood pressure, and even erectile dysfunction ... While the consumer price index rose just 12 percent during the period, one diabetes drug quadrupled in price and another rose 160 percent. Desperation is also propelling the increases, with drugmakers raising prices on products that remain under patent to offset sales declines from blockbusters that have lost such protection. And companies with older drugs boost prices when rivals show up, either to match the price of the newer drug or to make up for prescriptions lost to the competitor. While generic drugs pushed by insurers and the government now make up 86 percent of all medicines used in the U.S., that hasn’t reduced total spending on prescription drugs. “We have been consistently noticing that as manufacturers near the end of their product’s life cycle, they are seeking larger price hikes than they previously did,” says Sharon Frazee, vice president for research at Express Scripts Holding. According to a leaked draft copy obtained by Politico last May, the recent TPP trade agreement (that Congress just fast-tracked for Obama) "would give US pharmaceutical firms unprecedented protections against competition from cheaper generic drugs, possibly transcending the patent protections in US law [and additionally] those provisions could also help block copycats from selling cheaper versions of the expensive cutting-edge drugs known as biologics inside the U.S., restricting treatment for American patients while jacking up Medicare and Medicaid costs for American taxpayers." Robert E. Scott, the director of trade and manufacturing policy research at the Economic Policy Institute, noted: "By extending US copyright and patent protections to consumers in the rest of the TPP, which will dramatically increase the prices of prescription drugs, the treaty will shift billions in profits to big pharmaceutical companies while denying access to life-saving medicines to countless poor consumers." Pfizer’s 24 per cent corporate tax rate, which is one of the highest in the pharmaceutical industry — even though the "statutory tax rate for corporations is 35%, but the average "effective" tax rate American corporations were paying was a mere 12.5%. and because AstraZeneca is a British-Swedish multinational corporation, a tax inversion would have been used by Pfizer. Pfizer's accumulation of roughly $17 billion in overseas cash would attract a hefty penalty if repatriated to the US and taxed — American corporations already have over $2.1 trillion stashed in offshore tax havens. (It should be noted that Senator Bernie Sanders has also purposed legislation that would end the corporate hoarding of offshore profits in tax havens to avoid taxes). After the Astra rejection, Pfizer CEO Ian Read switched back to his “Plan A” by returning $12 billion to shareholders in share buybacks last year. The $17 billion acquisition of Hospira was welcomed by Pfizer investors, but it will do little to address Pfizer’s three big problems: the higher tax rate, unrepatriated cash profits and patchy pipeline ... Following a US Treasury crackdown on inversions, which allow companies to slash their tax rate by taking over a rival in a lower-tax country and moving its headquarters there, Pfizer’s options are limited. To realize the main benefits of an inversion, its shareholders would have to own no more than 60 per cent of any combined company. That would make AstraZeneca too small, leading some to suggest Pfizer should shift its sights to another, bigger UK group ... One contender could be Ireland-based Actavis. Its effective tax rate was just 4.8 per cent last year, and its limited roots in the Emerald Isle mean there would be no political outcry. 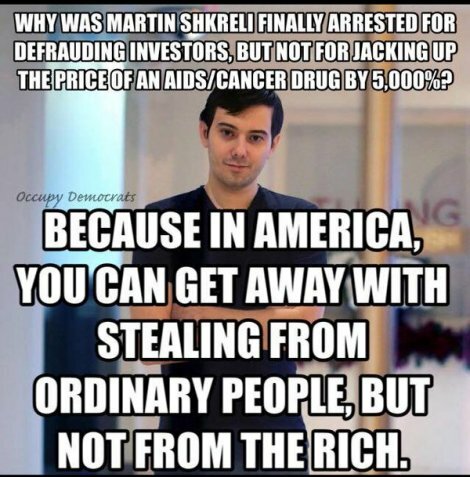 Some even suggest that Brent Saunders [not Bernie Sanders] the CEO of Actavis, could take the top job at Pfizer..."
Of Rotten Apples and Rotten Systems (December 21, 2015) Martin Shkreli [pictured above], the former hedge-fund manager turned pharmaceutical CEO who was arrested last week, has been described as a sociopath and worse. In reality, he’s a brasher and larger version of what others in finance and corporate suites do all the time. Federal prosecutors are charging him with conning wealthy investors. Lying to investors is illegal, of course, but it’s perfectly normal to use hype to lure rich investors into hedge funds. And the line between the two isn’t always distinct. Hedge funds are lightly regulated on the assumption that investors are sophisticated and can take care of themselves. Perhaps prosecutors went after Shkreli because they couldn’t nail him for his escapades as a pharmaceutical executive, which were completely legal – although vile. Shkreli took over a company with the rights to a 62-year-old drug used to treat toxoplasmosis, a devastating parasitic infection that can cause brain damage in babies and people with AIDS. He then promptly raised its price from $13.50 to $750 a pill. When the media and politicians went after him, Shkreli was defiant, saying: "Our shareholders expect us to make as much as money as possible.” He said he wished he had raised the price even higher. That was too much even for the Pharmaceutical Research and Manufacturers of America, Big Pharma’s trade group, which complained indignantly that Shkreli’s company was just "an investment vehicle masquerading as a pharmaceutical company". Maybe Big Pharma doesn’t want to admit most pharmaceutical companies have become investment vehicles. If they didn’t deliver for their investors they’d be taken over by "activist" investors and private-equity partners who would. The hypocrisy is stunning. Just three years ago, Forbes Magazine praised Shkreli as one of its 30 under 30 in Finance who was "battling billionaires and entrenched drug industry executives." Last month, Shkreli got control of a company with rights to a cheap drug used for decades to treat Chagas’ disease in Latin America. His aim was to get the drug approved in the United States and charge tens of thousands of dollars for a course of treatment. Investors who backed Shkreli in this venture did well. The company’s share price initially shot up from under $2 to more than $40. While other pharmaceutical companies don’t usually raise their drug prices fifty-fold in one fell swoop, as did Shkreli, they would if they thought it would lead to fat profits. Most have been increasing their prices more than 10 percent a year – still far faster than inflation – on drugs used on common diseases like cancer, high cholesterol and diabetes. This has imposed a far bigger burden on health spending than Shkreli’s escapades, making it much harder for Americans to pay for drugs they need. Even if they’re insured, most people are paying out big sums in co-payments and deductibles. Not to mention the impact on private insurers, Medicare, State Medicaid programs, our prisons and the Veterans Health Administration. And the prices of new drugs are sky-high. Pfizer’s new one to treat advanced breast cancer costs $9,850 a month. According to an analysis by the Wall Street Journal, that price isn’t based on manufacturing or research costs. Instead, Pfizer set the price as high as possible without pushing doctors and insurers toward alternative drugs. But don’t all profit-maximizing firms set prices as high as they can without pushing customers toward alternatives? Unlike most other countries, the United States doesn’t control drug prices. It leaves pricing up to the market. Which enables drug companies to charge as much as the market will bear. So what exactly did Martin Shkreli do wrong — by the standards of today’s capitalism? He played the same game many others are playing on Wall Street and in corporate suites. He was just more audacious about it. It’s easy to go after bad guys, much harder to go after bad systems. Hedge fund managers, for example, make big gains from trading on insider information. That robs small investors who aren’t privy to the information. But it’s not illegal unless a trader knows the leaker was compensated — a looser standard than in any other advanced country. Meanwhile, the pharmaceutical industry is making a fortune off average Americans, who are paying more for the drugs they need than the citizens of any other advanced country. That’s largely because Big Pharma has wielded its political influence to avoid cost controls, to ban Medicare from using its bargaining clout to negotiate lower prices, and to allow drug companies to pay the makers of generic drugs to delay their cheaper versions. On June 25, 2009, as a member of the Senate health committee, Senator Bernie Sanders said that real health care reform must address the billions of dollars in fraud and abuse that comes from the major corporations in the health care industry. The senator said Health and Human Services Department investigators found this year that 80 percent of insurance companies participating in the Medicare prescription drug benefit overcharged subscribers and taxpayers — and that Medicare and Medicaid fraud totals some $60 billion a year. 1) Health care must be recognized as a right, not a privilege -- every man, woman and child in our country should be able to access quality care regardless of their income. 2) We must create a national system to provide care for every single American in the most cost-effective way possible. So, what is stopping us from guaranteeing free, quality health care as a basic fundamental right for all Americans? I believe the answer ties into campaign finance reform. The truth is, the insurance companies and the drug companies are bribing the United States Congress. I want to make health care a right for every American. The health care industry doesn't like that very much, so they're flooding my opponents with cash. Fight back against those who want to stop a Medicare-for-all, single-payer system with a $3 contribution to our campaign. Make a $3 contribution to our campaign as a way of saying you have had ENOUGH of the health care and pharmaceutical lobby buying our candidates and elected officials. Thank you for standing with me on this important issue. Love these organizations who simply wipe out all competition in providing health care services in an area. Then, they play God and try to link credit/billing to obtaining health care. Haven't even gotten to insurance yet. Those drug prices are outrageous and the day they ban big pharma ads on TV is the day American society 100% improves immediately. Dean Baker, Center for Economic Research and Policy (December 28, 2015) If Patent Monopolies Bias Cancer Research, Why Not Have Publicly Funded Trials? What if we treated pharmaceutical companies as public utilities? That means in exchange for allowing them to own the rights to, and sell, medicines to the US population, they would have to accept a specific rate of return on their investment in research, production, etc. This would be a bit tricky to implement, but it would encourage research into new drugs, as the return would be guaranteed. At the same time, prices would be effectively moderated. Obviously there are some logistical issues, and it would require oversight of the research end of the business, but I think it could be made to work. The price for any drug would be the production cost, plus an amount that covers the development costs the company has for their entire portfolio of drugs. just a random thought. I don't think I understand enough about the pharmaceutical industry to understand the implications. Shire PLC. is a New Jersey-registered Irish-headquartered global specialty biopharmaceutical company that originated in the United Kingdom with a large operational base in the United States. Recently Shire PLC. announced an agreement to acquire U.S.-based biopharmaceutical company Baxalta Inc. for about $32.0 billion. Thermo Fisher Scientific, an American multinational biotechnology product development company, recently announced an agreement to acquire cellular and genetic analysis product provider Affymetrix Inc. for about $1.3 billion.